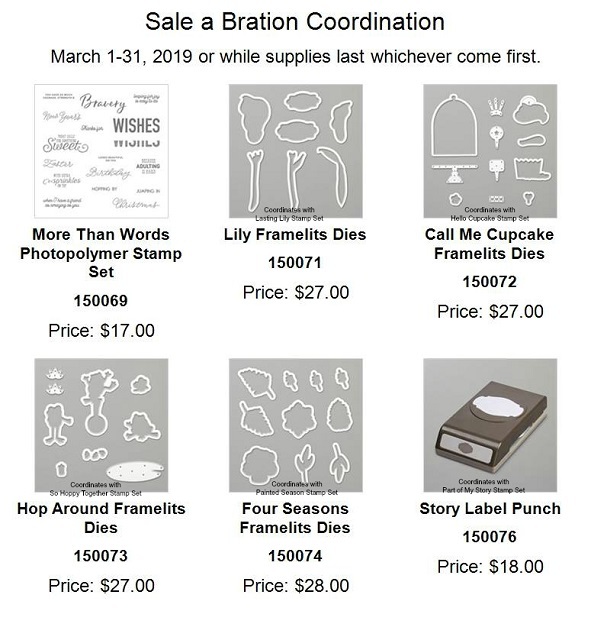 Before I get to today's Nine Lives and Beautifully Detailed Laser Cut Specialty Paper Card I have to share the new Coordinating Sale-A-Bration Items that will be available for you to purchase on March 1st. These items will ONLY be available for the month of March or WHILE SUPPLIES LAST and I'm betting they will go fast. Would you like to grab them now? Well, you sure can, simply by joining my team. Yep, you're already selecting $175 worth of products and only paying $99 and getting free shipping to boot. You CAN select these items below as part of your $175 and get them now. CLICK HERE for all the details for joining my team and remember THERE IS NO OBLIGATION or STRINGS attached, trust me you won't find a better deal :) If you've got ANY questions just give me a holler!!! I was so excited to see the new Nine Lives Stamp Set in the Occasions Catalog. I've had so much fun with my Cat Punch in the past and it's awesome how it can now be used with the Nine Lives Stamp Set. This card could be a valentine's card, a sympathy card, or a just because card for the cat lovers in our lives. I chose a frame from the Beautifully Detailed Laser Cut Specialty Paper when I began creating this card and worked my way out from it. My cat was stamped on Thick Whisper White because I knew I would color her in with my Smoky Slate Stampin Blends Alcohol Markers. The heart is from the Sunshine Wishes Thinlits Dies and are so versatile in card creations. 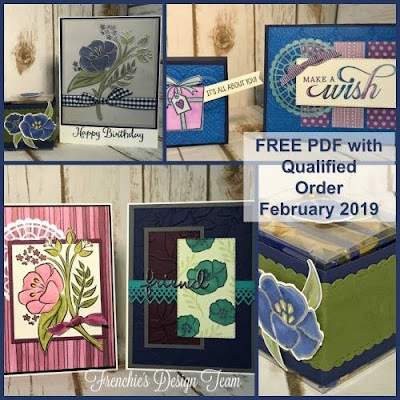 I love the sentiments in this stamp set as well and stamped them in Memento Tuxedo Black, colored with my Real Red Stampin' Blends Markers and cut them out using the Double Stitched Rectangle Dies. I assembled this card with Tombo Multipurpose Liquid Adhesive to allow me enough time to line all of my elements up. Dimensionals were used to pop up the sentiment and my creation was complete. I think it turned out PURRRRfectly (sorry couldn't resist). Card Base - Lovely Lipstick - 11" x 4 1/4" scored at 5 1/2"
Third Layer - All My Love Designer Series Paper - 5" x 3 1/2"